Earlier in 2018, it was mentioned that the 2019 GMC Terrain might just be the ‘right product at the right time’. With the 2019 lineup yet to be introduced at that point, the statement was driven by the fact that sales of the now-compact crossover had jumped by as much a 44% in the first three months of the year. Certainly an impressive example of an offering making its individual presence known, especially considering the relative over-saturation of the crossover market. That said, it’s worth noting that GMC seemed to show no interest in resting on its laurels, finalizing their 2019 offering with gusto, seeing through a number of changes and updates deserving of recognition. Just last year, the 2018 Terrain represented the beginning of the 2nd gen offering of the Terrain. Moving away from GM’s Theta 2 platform, the Terrain would now be built upon the D2 performance, the same used by current iterations of the Chevy Equinox, Cruze and Volt. The 2018 model year also brought the Terrain significant changes in terms of weight and dimensions. Smaller than its predecessor, the new Terrain was built upon lightweight architecture which contributed to an approximate weight loss of 400 LBS. Now, with 2019 offerings making their way onto dealer lots, it’s important to recognize how effectively GM continues to build upon their well-established momentum. If the Terrain had spent the last year being applauded as ‘the right product at the right time’, we might expect to see a continuation of this trend as we make our way through 2019. 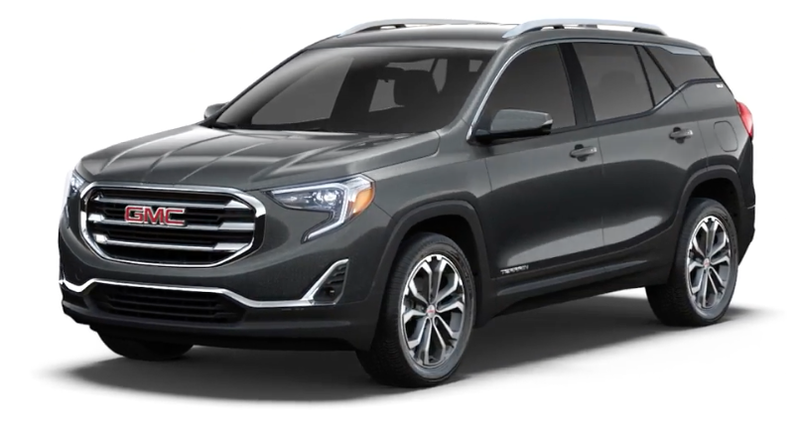 So with that in mind, let’s take a closer look at the 2019 GMC Terrain, and figure out just how well-positioned it is for continued success. The Terrain is served up in three primary trim levels: the (base) SLE, SLT and Denali trim. Based on the SL trim, the starting price point for the Terrain is around $25,000. Equipped with a 1.5-liter turbocharged engine paired with a 9-speed automatic transmission. Fuel economy falls in somewhere around 30 mph (highway, 26 city) and max towing capacity caps off at around 3,500 LBS. By upgrading to the Denali trim, your powertrain is upgraded to a 2.0-liter turbocharged engine. Mileage stays consistent at around 28 mpg (city, 22 mpg highway) and Terrain remains ready for up to 3,500 LBS in towing. With pricing starting around $37,600 MSRP there a number of upgrades, badging and otherwise, that are deserving of a nice in-depth examination. For example, consider the inclusion of a 7-speaker BOSE sound system, or the innovative new hands-free tailgate that seems to have been the subject of countless trade articles as of late. Such value-added features only reiterate the expectations of quality that one should expect from, well, just about everywhere. In terms of changes made to the core aesthetic of the Terrain, there weren’t many. It can mostly be summed up as the inclusion of Smokey Quarts Metallic as a new color option, and a reorganization of some of the enhancement packages, minimizing some of the add-on options. It goes without saying that safety is paramount. With this in mind, GMC has upgraded both the Rear Vision Camera and its SurroundVision software to present its video content in High-Definition (HD). In addition, the Terrain will now enjoy full-speed Adaptive Cruise Control and Front Pedestrian Braking. While such features are becoming progressively more ‘standard’ with each passing model year, it’s worth noting which automakers are still operating with the advantage of a lead and it’s fair to say that GM as a whole seems to excel in this regard. While most of the changes made to the 2019 Terrain are in regard to the packages offered, here’s a rundown of what you can expect to find. First, the Terrain is served up in four Metallic exterior colors: Ebony Twilight, Graphite Gray, Satin Steel and Sedona as well as Summit White. In terms aesthetic notes, it’s worth pointing out the Dark Accent Package (available on SLT trim levels) which includes a three-bar grille with black surround and charcoal insert, as well as black painted mirror caps, black rear license plate and black fascia inserts for both front and back. In terms of the cabin experience, the Interior Enhancement Package (available on both SLE and SLT trims) includes premium carpeted floor mats, embroidered front row headrests, as well as 19-inch gloss black aluminum wheels and other ‘dark’ accents ranging from badging to roof rails. The Infotainment Package (available on the SLT and Denali) includes a new HD Rear Vision Camera, replacing an outdated model. Standard on SLE and SLE Diesel models is a 4.2-inch multi-color driver information screen, with audio, phone and navigation capabilities added as part of the package. Another helpful feature is wireless charging for your smartphone. Also noteworthy are the Driver Alert Package II, and Advanced Safety Package. The former carries over the valuable driver-assistive features from the previous model year, and the Safety features follow suit. 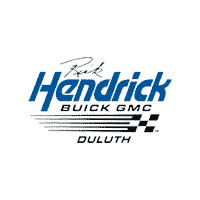 Find out for yourself today, by visiting Rick Hendrick Buick GMC in Duluth. Take it for a test drive, and let us know whether you agree that GMC is taking all the right steps to improve upon the Terrain for 2019.